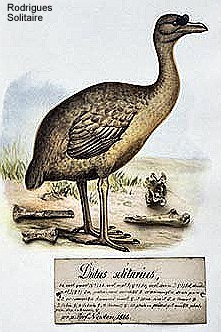 The Rodrigues Solitaire (Pezophaps solitaria) is an extinct flightless member of the pigeon family. It was a close relative of the Dodo and of the Nicobar Pigeon. It was endemic to Rodrigues, Mauritius. It is believed to have become extinct due to hunting and predation by introduced cats. It is believed to have become extinct in the 1760. The Rodrigues Solitaires had unusual large, gnarled knobs of bone at the base of the thumbs. It is believed to have been used as a weapon.